The Football Association hopes to encourage more young girls to play football, after revealing that almost half don't believe that it is a suitable game for them. FA research found that only 56% of girls aged seven to 11 believed that football is suitable for girls, compared to 81% who think it is suitable for boys - a difference of one in four girls. Comparatively, tennis (79%) and netball (66%) were deemed to be more suitable sports for girls. 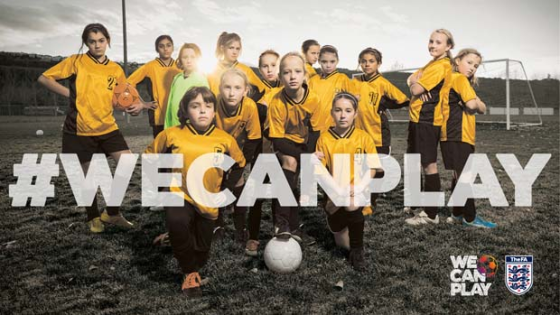 The new 'We Can Play' campaign aims to shatter these lingering preconceptions by tackling the issue head on, in a bid to increase confidence in girls wanting to take up the game and boost participation. The FA hopes to canvass the support of 100,000 girls and parents for the campaign, sparking wider debate about perceptions of women’s football. Football is the biggest female team sport in England - and fourth biggest overall - but the FA believes that negative perceptions of the women's game - caused by peer pressure, gender stereotyping and even derogatory results of internet searches - are proving a barrier to even greater participation in the game. Their survey of seven to 11-year-old girls - all interested in football but not currently playing for a team - found that just 21% of girls aged 7-11 felt confident playing football. It also revealed that increased confidence led to greater enjoyment which, in turn, increased the likelihood of girls wanting to join a football club. Parental attitudes to the girls' game were also revealing. Only 59% of mums and dads of girls aged seven to 11 'strongly agreed' football was suitable for girls, compared to 85% who believed the game was suitable for boys. Netball (79%) and tennis (73%) were again deemed more suitable for girls by parents, demonstrating an uneven playing field in terms of gender perception, while parents were also less likely to encourage daughters to take up football than sons. They are also more likely to discourage daughters from playing than male children. Kelly Simmons, The FA’s Director of the National Game and Women’s Football said: "We need to ask ourselves - why do these perceptions still pervade? "The FIFA Women’s World Cup is currently taking centre-stage and domestically, the FA Women’s Super League continues to grow. The profile and professionalism of the women’s game has never been greater. "The FA is doing its part to ensure the game is an attractive mass participation sport for girls and women, but we should ask why does society allow antiquated attitudes to persist? "Let’s have an open and honest discussion – in doing so we want to shatter the myth that football is for boys, and give thousands of girl the opportunity to enjoy our beautiful national game and all the benefits of taking part in team sports. "Increasing girls’ confidence that football is a sport for them and showcasing positive role models - many of whom will be appearing in our screens when England take on France – are crucial." Find out more about We Can Play on the FA website or search #WeCanPlay on social media.